We did something on our family vacation this summer that I never told you about. We visited one of those paint-your-own-pottery places. It was not a planned visit, by any means. We had been out to dinner for our last night of vacation and we were walking by and the kids begged to go in and paint something. They had begged for this last year, too, but this year I had just had 2 martinis and I was weak. So, in we went. Dale and I made the Executive Decision that we would choose ONE piece and we would all work on it together. 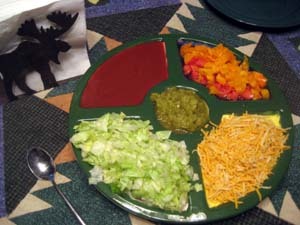 I found a chip ‘n dip plate and that seemed like a good idea – 5 sections, one for everyone. Here we are, listening intently to our instructions, choosing colors, and sketching ideas. Looks like fun, right? And it was, truly, a blast. We laughed and joked and had a great time. But when it comes to artistic ability, well, we might be lacking a bit in that area. In our defense, they told use about 10 minutes after we started that the place was closing early and we only had 10 minutes to finish. So, we were pressured. Also, in our defense, the brushes they gave us to use were crap and you have to go over each thing you paint 3 times, not an easy task. Of course, the real kicker was when we finished and I brought the disaster thing plate up to the counter to pay for it. Between the ceramic piece itself and the studio fees and the shipping costs it was almost $80. Oy. I thought Dale was going to fall off the chair when I told him the price. But, I told him, it was our vacation and it would be a great memento of the trip, crappy artwork and all. So we went home and went back to work and life and school and in the midst of all of that I sort of forgot about it. Until I called home from the airport in Salt Lake City to tell Hannah I had arrived safely. And she screamed into the phone, “The family plate is here! The family plate is here!” Naturally I made them promise not to open it until I got home. After all, we needed to be together for the great unveiling. Are you ready? Pathetic, yes? Jessica’s flower is actually pretty good but Hannah’s musical notes? And Dale’s shooting star? And Patrick’s skateboard? And my green “07” in the middle? Not so much. $80 for a family heirloom that looks like it was painted by a bunch of monkeys. Or, in our case, a bunch of Swedish monkeys. 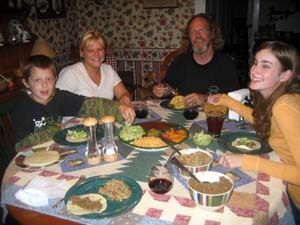 Nevertheless, at this week’s family dinner we had tacos. And all the toppings went on the family plate. It doesn’t look so bad when the sections are all filled up. Heh. And it looks downright okay when it’s surrounded by my smiling family. So that’s our new heirloom. Some families have jewels. We have a plate. Go figure. $80 for an item that will make you laugh and tell the story dozens of times over the years seems like a steal to me. 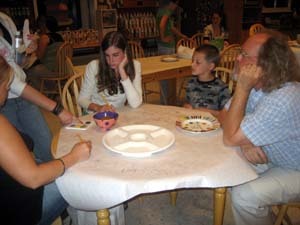 My “bridal shower,” such as it was, was at a paint-your-own-pottery place near Boston. 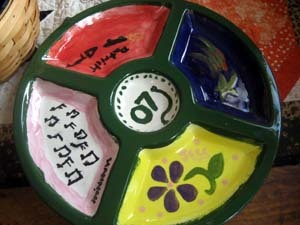 Instead of bringing gifts, each of my friends painted me a piece of pottery. Now I have a motley assortment of pieces decorated in ways highly reminiscent of your chip and dip plate. (Perhaps you and I should get together for a pot luck.) They’re far uglier than any other serving items I own, but I must admit they highly amuse me. When I saw the first picture, I thought you were all sitting around a very disappointing, empty plate meal!